To an outsider, the life of a royal protection officer must seem impossibly glamorous — jetting off to exotic locations, rubbing shoulders with famous names and having the safety of one of the most recognised people on the planet in your hands. But while aspects of that are true, guarding a member of the Royal Family is never easy. The demands on your time are immense and you can’t relax for a moment. Which is why I have nothing but sympathy for the young police officer who made headlines when she whisked the Duchess of Sussex out of harm’s way on an overseas visit, now deciding to stand down from her role. No one knows better than I do the pitfalls and pleasures of protecting a celebrated figure. 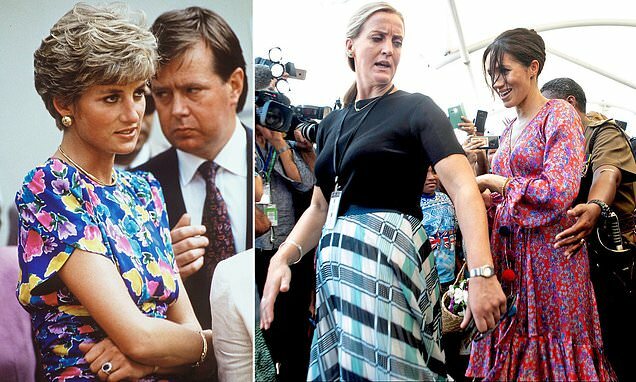 For eight years I worked alongside Princess Diana — and before that William and Harry — when she was at the height of her fame. Since news emerged that the Duchess of Sussex’s protection officer, who has not been named for security reasons, was quitting — she is also leaving the police — some commentators have suggested it must be difficult to guard a royal who likes to ‘go off-piste’. This, I take them to mean, is the notion that the Duchess of Sussex likes to interact with the public on her walkabouts, wanting to be seen as one of the people, and that she finds the presence of a close protection officer difficult. Some also say this officer’s departure is because the Duchess is difficult to work for. I have no idea whether that is true, though she is the latest in a string of aides to have stopped working for her in recent months.